At the show or at our shop, we can help with damaged displays and trade show booths. The exhibiting life can be tough, and definitely on your display. Bring in your dirty, damaged, or disjointed hardware and our repairs team will do a free assessment. We’ll do simple repairs and clean up on-site, and help you determine the best solution for more extensive problems. 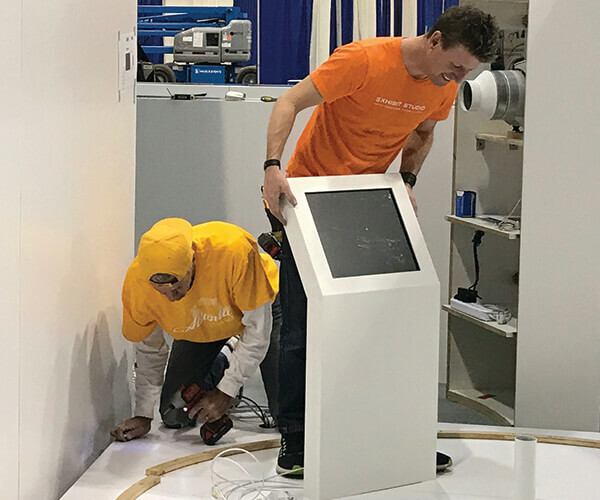 Our displays are meant to last for many years and lots of shows, but from time to time your graphics or hardware may require maintenance to keep them in good condition. Many of our display systems come with a lifetime warranty and we stand behind every product we sell—bring in your display whenever it needs a tune-up. Problems with a product we don't sell? We will do our best to fix it up! Tracey and her team have been developing our exhibits for us for over 13 years. Their creativity, knowledge, professionalism and understanding of our needs have provided us with an exceptional product every time. I would not hesitate to recommend their services for all your trade show and exhibiting products. Stacy Thygesen, JSK Consulting Ltd.